If you are a new or long-time business owner, you will need to invest in commercial HVAC services. For a new business owner, thinking about the functionality of your building may seem daunting. It may not be something you had to consider often. For a long-time business owner, you may be having issues with your current provider or HVAC system. You deserve better, and so do your employees. Luckily, Go Admiral promises to “spoil you with service”. Firstly, Go Admiral is the only HVAC system contractor in Houston who offers a Lifetime Warranty on your equipment. As a business owner, you want to do all you can to save money on building expenses. Opening a service contract with Go Admiral for your Spring location will save you the stress of worrying about it yourself. Go Admiral has been operating in Houston since 1990, so you know they commit to their community. They offer emergency repair services and having regular maintenance for your HVAC system will extend its lifetime. An authorized dealer of the best-of-the-best equipment can ensure you get ideal service. Every technician is highly qualified and most have been with the company for a long time. They are Houston residents just like you, and if the pros can trust Go Admiral, you can too. This subject has been a highlight in our blog once before. 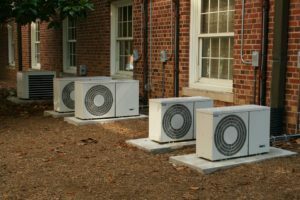 Regular service maintenance of your HVAC system is shown to have many benefits. These benefits include longer operating life for your HVAC system, shrinking energy and repair costs, and keeping your air cleaner. We are sure you’ll agree that the benefits are convincing. Save yourself the hassle by providing clean air for yourself and your employees. After all, you are a responsible business owner who knows what’s best for you and your Spring, Texas, location. Furthermore, if you contact Go Amiral’s Spring location, you can get a free second opinion. If you’re having some issues with your HVAC system and want real professional analysis, Go Amiral will be there for you in your time of need. Invest in commercial HVAC services, it will be well worth it. Houston’s Go Admiral can provide this service at a financed rate. They are a family owned company that has open operation all over Houston and has many services to offer. If you have questions about your HVAC system, the qualified professionals at their Spring location can help. Call (281) 876-9400 for more information. Go Admiral also has locations in Katy, The Woodlands, and Tomball, which can all be seen on their website here. Houston, Texas, is their home. More information about this beautiful city can be found here. Poor Indoor Air Quality Can Threaten Your Health! People spend 75-90% of their time indoors. Particulates are tiny particles suspended in the air. Common particulates include residential pollen, dust mites, dust, smoke and dander (skin flakes). Particulate diameters are measured in microns and range from .001 to 1,000 microns. These dimensions represent the continuum from a few molecules up to the size where particles can no longer be airborne. Particulates are removed from the air by filtration. Air filters differ in effectiveness as they can trap different size particulates. These are bacteria, germs, viruses, fungi, spores and mold. Although bacteria are small in size and usually microscopic, they have an amazing ability to do horrible damage to all living organisms including humans. Many everyday illnesses are also caused by viruses like the common cold or the flu. Microbials are living organizations that must be killed. Indoor odors and gases, such as benzene, formaldehyde, chloroform, hydrogen sulfide, ammonia, etc., are released from furniture, cabinets, carpets, cleaning chemicals, copy machines, insulation, insect sprays, hair sprays, etc.